Charles Henry Forbell was born in Brooklyn, New York on September 11, 1885, according to his World War II draft card. In the 1900 U.S. Federal Census, he was the oldest of four children born to Charles and Margaret. He lived in Brooklyn at 408 Warwick Street. His father was a letter carrier. The 1930 census said he married at age 24, which would have been from late 1909 to early 1910. In the 1910 census (enumerated in late April) he and Elsie lived in Queens, New York at 129 Napier Avenue. (Today the street name is either 108 or 109 Avenue in the Richmond Hill area.) He was an advertising artist. Photos of him can be viewed here. AskArt.com said, "…Charles Forbell created the comic 'Naughty Pete', which appeared in magazine Judge from 1910 until the late 1930s. Apart from doing newspaper comics, Charles Forbell did much commercial work. One of his most prominent productions was 'Mr. Peanut', the Planters Peanut Symbol that is familiar around the world (although he did not create it, he was asked to do the design on it)…." Forbell and his wife had a six-year-old son as recorded in the 1920 census. They resided in Queens at "First Street (214 Street)." His occupation was artist. In this decade he produced strips such as Soosie the Shopper and Cuddles. Ten years later the family lived at 218 Park Lane in Queens (the Douglaston and Little Neck area). He was a magazine artist and cartoonist. He signed his World War II draft card on April 27, 1942. His home was in Bayside, Queens at 42-01 220 Place. He was self-employed, with an office at 274 Madison Avenue in Manhattan. His description was 5 feet, 8 inches, 143 pounds, brown eyes and gray hair. Forbell passed away at home on April 15, 1946. The Brooklyn Eagle reported his death the next day. Charles H. Forbell, 60, cartoonist who began his art career as a staff artist on the old New York World after he was graduated from Pratt Institute, died yesterday at his home, 42-01 220th Place, Bayside, after a short illness. For the last 30 years he was cartoonist for the Rogers Peet Company, his sprightly sketches heading the newspaper advertisements of that concern. Years ago, in the old Life Magazine, he had a series of cartoons entitled, "In Ye Goode Old Days." The cartoons were a medieval satire of the doings of knights in armor. This same idea was continued by Judge in full page style under the caption, "In Ancient Times." He also had a series of cartoons in Judge called "Ancient Sources of Modern Inventions." For many years he was cartoonist for the Aetna Casualty and Surety Company of Hartford, Conn., and contributed drawings to the advertising sent out by the Central Savings Bank of New York. Surviving are his wife, Mrs. Elsie Knapp Forbell; a son, Richard C.; his father, Charles Forbell of Brooklyn, and three sisters, Mrs. Wilson A. Higgins, Mrs. Maude Raymonde and Mrs. William Lyons. Funeral services will be held at 8 p.m. tomorrow at the Fairfield Chapel, 141-26 Northern Boulevard, Flushing. Jack Whiting McGuire was born in Pensacola, Florida on September 13, 1905, according to an January 1, 1946 obituary in the Dallas Morning News (Texas). In the 1910 U.S. Federal Census, he was the second of four children born to John and Blanche. They lived in San Antonio, Texas at 415 Burleson. His father was a machinist at a railroad shop. Some time later his parents divorced according to the next census. Main Avenue High still "points with pride" to Jack McGuire as its leading artistic asset, although he has been out of school for two years past. Since leaving school he has done drawing and lettering for various firms and at present is employed in the art department of an engraving company. He insists that he has had no training at all so far, as, in school, they didn't teach what he wanted to study in the way of drawing. He won a big poster contest in Main Avenue however, with three cartoons. He will go to the Academy of Fine Arts in Chicago in the fall. His home is at 309 Abiso Avenue. The Morning News said, "In 1927 the artist established his own school of commercial art, first and largest such school in the Southwest. He maintained it until 1942." The Commercial Art School, under the personal direction of Jack W. McGuire, has enjoyed eight years of continued art classes for the art students of South Texas. It has helped place dozens of students in the advertising art services and engraving plants in San Antonio and other Texas cities…. …Cartooning under Mr. McGuire, who drew the Sunday comic strip "Jane Arden," and now collaborates with John Welch on the cowboy strip, "Bullet Benton" which runs daily in the San Antonio Express, offers every boy or girl who is interested in comic illustration a chance to develop and produce professional work of their own…. ...The services of G.L. [George Lee] Reynolds and T.C. [Thomas Connally, his younger brother] McGuire have been added as instructors. Both are well known in their respective fields of commercial advertising. Photofunny album, 1-3. © 1 c. each Dec. 26, 1935 ; G 22062-22064. He was profiled in the San Antonio Light on July 30, 1938. A cartoonist, like a prophet, sometimes is without honor in his own country. So, at least, finds Jack McGuire, 2424 Broadway, who draws a syndicated comic strip called "Bullet Benton," an adventurous son of the West. "Bullet" does his stuff daily in but two Texas papers, while he enjoys wide circulation in the New England states and on the West coast, and even is translated into French for Canada and Spanish for Mexico. Jack has been drawing "Bullet" for about four years now, and has come to the point where he knows the character rather well. 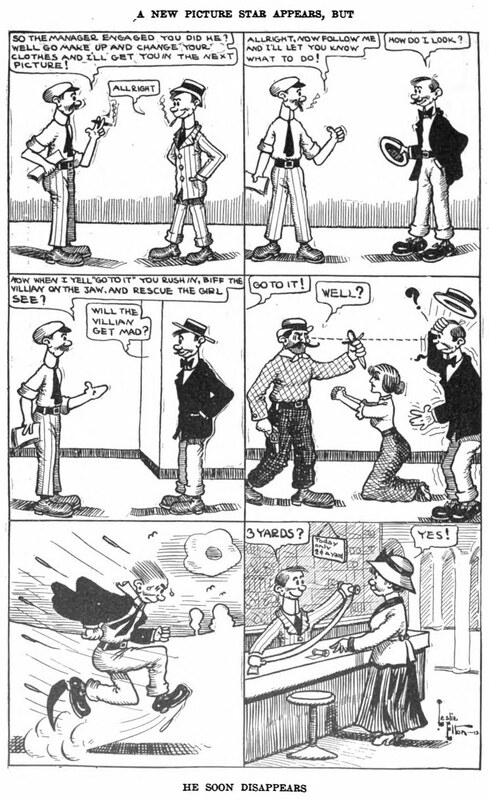 Jack, however, merely draws the strip, for the continuity is written by John Welsh [sic], who lives in Evanston, Ind. McGuire doesn't even know how many papers actually do carry the strip, for that is all handled through the syndicating firm in Des Monies, Iowa. But right now Jack has "Bullet" in a big New York rodeo, and he's doing right well, too. McGuire passed away on December 30, 1945, in San Antonio. Two days later the San Antonio Light reported his death. Funeral services for Jack Whiting McGuire, 40, nationally known comic strip artist of 301 Lamont avenue, will be held at Porter Loring chapel at 4 p.m. Tuesday. McGuire died in Nix hospital Sunday night after an illness of one month. Reverend Kermit Gibbons will officiate at the funeral. Ralph Briggs Fuller was born in Capac, Michigan on March 9, 1890, according to his World War I and II draft cards. The Art of the Comic Strip (1971), Who's Who in American Art (1938), and World Encyclopedia of Comics (1983) said he was born in Michigan. Wikipedia said he was born in Boothbay Harbor, Maine, but that was where he died. 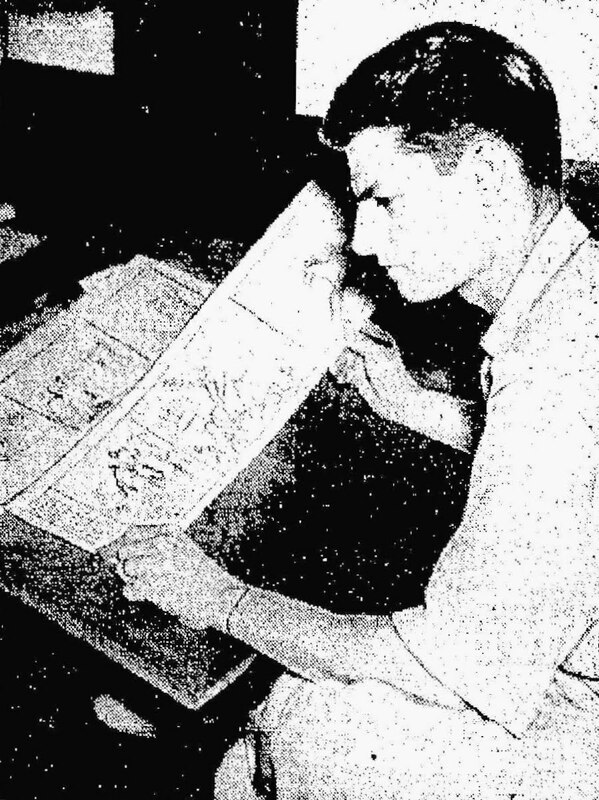 …Fuller was 16  when he sold his first cartoon to the old Life for $8. The next mail, he received a Life letter saying, sorry, they had al­ready used that joke and would he please send back the $8. He did. But he soon sold them an­other cartoon. He attended the Chicago Academy of Fine Arts, and while working as a staff artist for the Chicago Daily News, he got $100 for the first colored picture ever reproduced by Life. That sold him on the magazine market. He decided to come to New York. …Fuller's first work in a major market was a drawing sold to Life magazine in 1910. It was incredibly crude and out of place in that journal, but editor J.A. Mitchell obviously had a sixth sense about latent talent…. 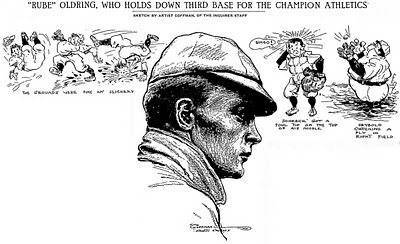 In short order Fuller was the most published cartoonist in American magazines. 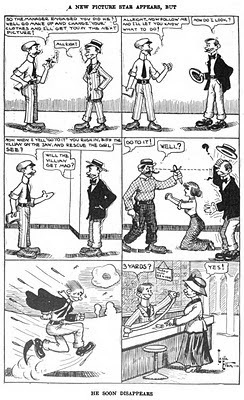 His panel cartoons filled the pages of Puck, Life and Judge, as well as Collier's, Harper's, and, later, Liberty, Ballyhoo, College Humor, and occasionally the New Yorker. His work was so popular that in the early 1920's Judge devoted a standing feature—Fuller Humor—to his work, an honor afforded dew others. A New York passenger list, at Ancestry.com, recorded Fuller who returned from England on August 10, 1914. His address in New York City was 17 Livingston Place (Stuyvesant Square). He signed his World War I draft card on June 5, 1917. He and his wife lived in Brooklyn at 217 East 16th Street. His description was medium height, slender build, with hazel eyes and dark brown hair. In the 1920 census, Fuller, his wife Alexa and year-and-a-half-old son Robert lived in Leonia, New Jersey at 170 Ames Avenue. His occupation was artist. He was recorded at the same address in the 1930 census and the family included daughter Elizabeth. His strip Oaky Doaks debuted on June 17, 1935. The Who's Who in American Art entry had the New Jersey address, and his home address as West Boothbay Harbor, Maine. He signed his World War II draft card on April 25, 1942. He lived at the same New Jersey address. He was self-employed and described as five feet eight-and-a-half inches tall, 145 pounds, gray eyes and hair. Oaky Doaks ended its run in 1961. Fuller passed away on August 16, 1963, in Boothbay Harbor. The Omaha World-Herald (Nebraska) reported his death on August 17. Wikipedia said he died on August 17. He was survived by his wife and two children. i wouldlike to know more on ralphs paintings and pencil drawings.there is hardly any information on his works apart from oakey dokey. Leslie Elton's full name is Leslie Elton Brownley. He was born in Lock Haven, Pennsylvania on August 27, 1893, according to his World War I draft card. In the 1900 U.S. Federal Census, he was the oldest of three children born to William and Nina. They lived in Waverly, New York at 118 1/2 Providence Street. His father was a furniture polisher. The 1910 census recorded W.B. McCaffery, Elton and his two sisters, Maud and Charlotte, in Philadelphia, Pennsylvania at 1611 Girard Avenue. The head of the household was McCaffery, a woman, with Elton and his sisters as her son and daughters. This was an error in the census. Perhaps the wrong name was given to the enumerator or maybe McCaffery belong to the preceding household but inadvertently replaced Nina Brownley. In any event, Nina was the head of the household and a widow caring for her three children, her father Frank, a widower, and his older sister Anna, an unmarried woman. Also, in the household were Hannah Bentley (misspelled "Bently" in the census) and her two sons Robert and Walter. According to the 1860 census, Frank had three younger brothers, William, John and Charles. From the census records, I believe Hannah married either John or Charles and one of them passed away before the 1910 census. Years later, Hannah and her sons would figure into Elton's life. Frank passed away on May 26, 1911 according to the Philadelphia, Pennsylvania, Death Certificates Index at Ancestry.com. Elton's work appeared The Motion Picture Story Magazine. The Moving Picture World reported Elton's move to animation in its September 9, 1916 issue. Leslie Elton, Cartoonist, Joins Paramount-Bray Forces. 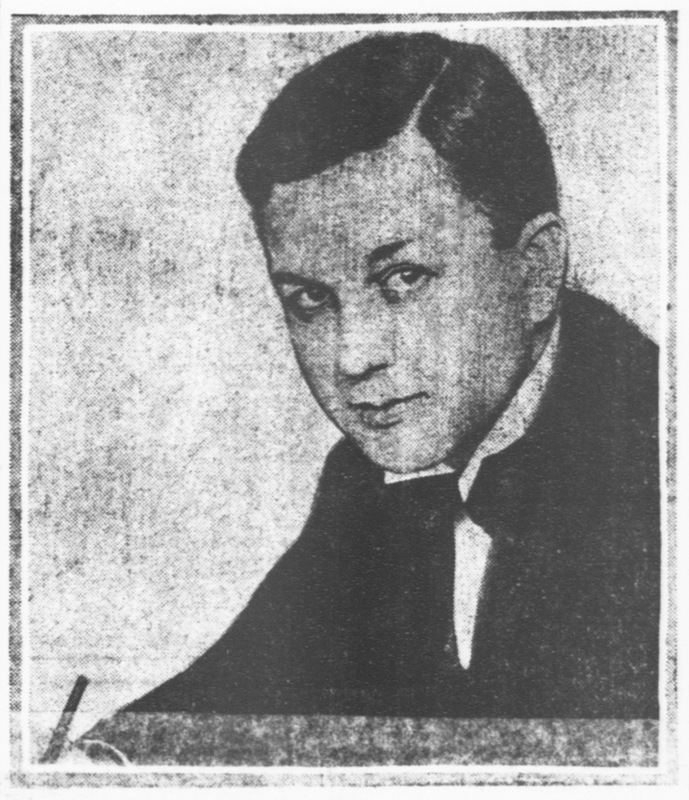 Leslie Elton, the well-known cartoonist, who has contributed to the Philadelphia Record,Public Ledger, Motion Picture Magazine, Photoplay Journal and the St. Louis Globe-Democrat, has joined the forces at the Bray studio, and will contribute his comedy to the Paramount-Bray Animated Cartoons, the weekly animated cartoon released by the Paramount Pictures Corporation. The enlargement of the staff of cartoonists at the Bray Studio will enable the producers to give a great variety of subjects. Mr. Elton will work on variety of subjects. In the book Before Mickey: The Animated Film, 1898-1928 (1993), Donald Crafton said, "…Elton, a newspaper sports cartoonist, joined in September 1916 and took over the 'Heeza Liar' series." 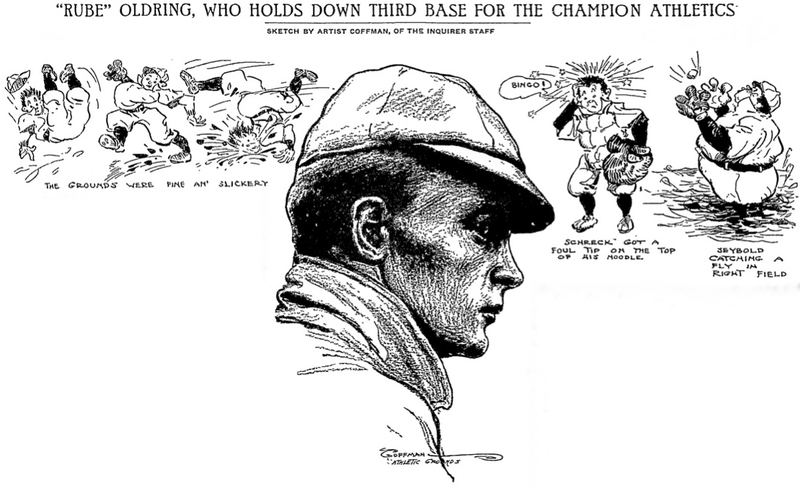 Elton drew himself inking at the drawing board in the November 1916,Cartoons Magazine. and will contribute pen-and-ink comedies for the movies. Elton signed his World War I draft card on June 5, 1917. He lived in Manhattan, New York City at 112 East 31 Street. He was a cartoonist at the Cameragraph Film Company, 140 West 44 Street, New York City. His description was medium height, slender build with gray eyes and brown hair. The Big Cartoon Database has a list of his work. The 1920 census recorded him in Ridgefield Park, New Jersey at 112 Hobart Street. His mother was head of the household, which included her daughters and their husbands. Not only was Elton a motion picture cartoonist, but so were his brother-in-laws Vaughan Kaufman and John McManus. Both sisters were motion picture actresses. In 1920 he received a patent. For the Newspaper Enterprise Association Service he produced Jack Daw's Adventures in 1922; the first eight weeks are here: 1 2 3 4 5 6 7 8. The date of Elton's move to California is not known. Hannah passed away on June 3, 1964 and was followed by Elton on July 16, 1966, both in Los Angeles, according to the California Death Index at Ancestry.com. He was recorded twice in the index as Les Elton and Leslie Brownley. I believe his obituary was published in The Los Angeles Times on July 16. If anyone has ProQuest, please let us know of any additional information. 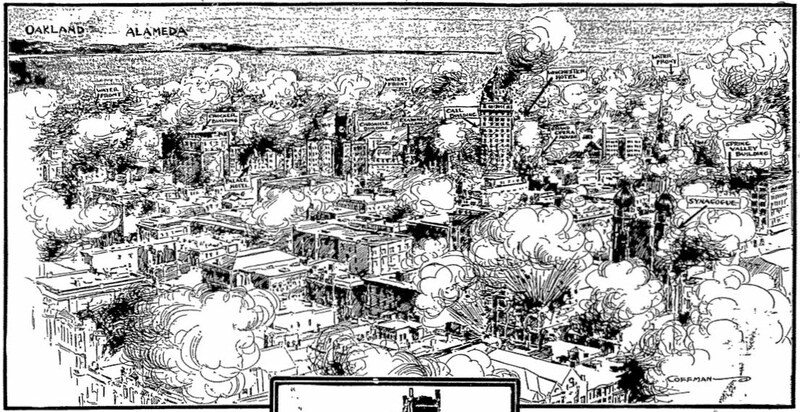 ...his first cartooning job was with the San Francisco Post in 1898. He was 15, and drew for $3 a week. He also worked on the Los Angeles Herald and Los Angeles Times while still in his teens. In 1906, he went to the Philadelphia Inquirer. He first gained fame when the San Francisco earthquake and fire struck [April 18]. Coffman drew sketches for the Inquirer from memory of downtown San Francisco buildings. He filled in details of the ruin from the wire reports. Before coming to the Star-Telegram, he was on the staff of Hearst's New York Journal & American for 27 years. 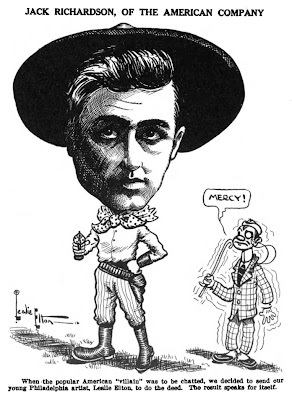 While working temporarily at the Chicago Examiner, he caught the fancy of the late famed columnist, Arthur Brisbane, and Coffman became cartoonist for the full page Brisbane editorials that were featured in all Hearst Sunday papers. Brisbane became editor of the Examiner in 1918 then in the 1920s moved to New York. The 1920 census recorded Coffman in Brooklyn, New York at 1722 Caton Avenue. His occupation was newspaper cartoonist. Ten years later, he remained in Brooklyn but at 60 Clarkson Avenue, and continued as a newspaper cartoonist. His daughter's occupation was recorded as artist. He received a Freedoms Foundation award for his cartoon, “They Had Trouble, Too; Were Unafraid,” according to the Corpus Christi Times (Texas), February 22, 1955. Coffman passed away on August 31, 1958, in Fort Worth, as reported by the Dallas Morning News. He was survived by his wife, daughter and granddaughter. He also is the artist of tipped in full color illustrations for the limited edition book, "High Cost of Living," by Thomas Lawson, published in 1913 in Boston. Sylvia Sneidman was born in Maryland on November 16, 1909, according to a 1931 passenger list at Ancestry.com. In the 1910 U.S. Federal Census, she was the youngest of two daughters born to Maurice and Rose. They lived in Baltimore, Maryland at 2820 Parkwood Avenue. Her father was a traveling salesman. In 1920 they lived in Newport News, Virginia at 76 33rd Street. The Sneidmans moved again, to Pittsburgh, Pennsylvania at 5821 Phillips Avenue, according to the 1930 census. The Sun (Baltimore, Maryland) reported, on July 10, 1931, that Maryland Institute students, including Sylvia, had reached Europe‎. She returned from the trip on August 14, 1931, in New York City, as recorded on a passenger list. She found work at the Pittsburgh Press. The June 20, 1934 Press published her fashion drawings. The Star (Wilmington, Delaware) published her illustration for a serial story on May 12, 1935. 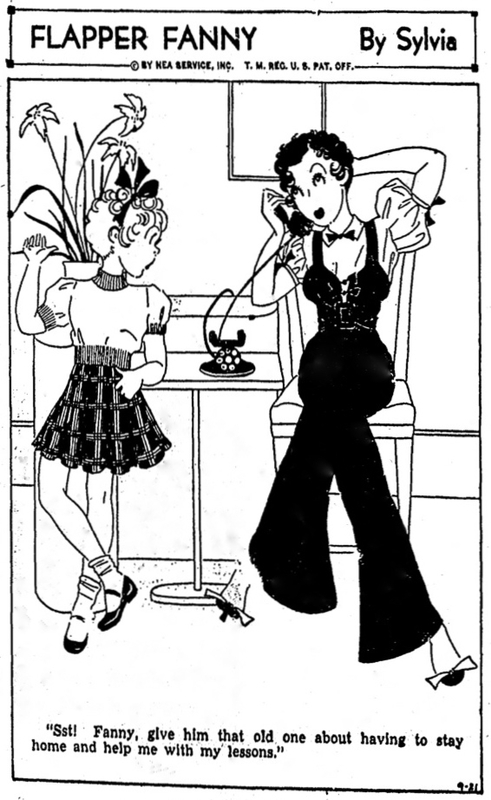 Flapper Fanny Says was revamped and retitled, Flapper Fanny (above), with Sylvia, beginning on December 8, 1935. Her marriage was reported in the Press on April 17, 1937. Mr. and Mrs. Maurice Sneidman, of Shady Ave., have announced the marriage of their daughter, Miss Sylvia Sneidman, to Dr. Sidney Robbin, son of Mr. and Mrs. Robbin of New York City. The ceremony took place yesterday in New York, where the couple will reside. The bride is a graduate of the Maryland Institute of Art, where she was winner of a traveling scholarship on which she toured Europe. Formerly a member of the art staff of The Pittsburgh Press, she is now an artist for Newspaper Enterprise Association, handling fashion drawings and such features as "Flapper Fanny," used daily in The Press and other newspapers. Dr. Robbin is a graduate of Johns Hopkins University. Sylvia passed away in January 1989 according to the Social Security Index. 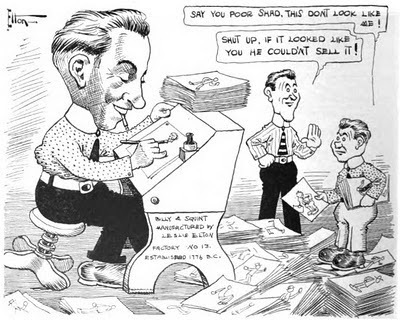 Editorial cartoons of particular interest in North Carolina and the South will be published regularly in The Dispatch, through arrangements with Henry McCarn of Charlotte. He is the operator of "State Cartoon Service" and his work has brought honors to the newspapers he serves and to himself. McCarn developed the cartoon service while he was assistant manager of Belk's, in downtown Charlotte. He sketches political and newsworthy events for editorial pages, designed to meet the needs of North Carolina editors and publishers. "Editorial cartooning is a tremendous responsibility," McCarn says. Keeping up with news developments, he spends many hours reading newspapers and magazines and listening to newscasts. He draws with a happy combination of newsworthy ideas and unmistakeable evidence of deep conviction, plus delightful humor. "A cartoonist should be a good reporter, illustrating history in the making," he says. "A cartoonist's work is tied in with the stuff of life—politics, the needs, successes, joys and sorrows of people." Some of his cartoons have appeared in "Editor and Publisher" and in a number of other publications in addition to the newspapers he serves. In 1954 the Julius Mathews Newspaper Service of New York honored him with an award for his editorial cartoon on the cancer crusade, which appeared in the Raleigh News and Observer. Mr. and Mrs. McCarn live at their country home known affectionately as "Pine Acres". His studio is located at 428 Hawthorne Lane in Charlotte. The McCarns are members of Hawthorne Lane Methodist Church, where Henry, is close associated with the church school activities, and has a deep sense of Christian responsibility, and says: "With the help of God my best cartoons are in the future." They have two sons, Ural and Robert Gabriel. Ural lives in San Fernando, California. Robert lives in Charlotte. Mr. and Mrs. McCarn have three grandchildren. [A photo and an editorial cartoon are here. Henry McCarn was born in Belmont, North Carolina, on March 13, 1904, according to the North Carolina Birth Index and his World War II draft card at Ancestry.com. In the 1910 U.S. Federal Census, he was the sixth of seven children born to Jacob and Laura. They lived in South Point in Belmont, North Carolina. His father was a picker at a cotton mill. In the 1920 census the family remained in South Point. Ten years later, McCarn, an older brother and parents lived in Belmont at 57 First Street. He was a warper at a cotton mill. Information about his art training has not been found. Hill's Charlotte City Directory 1938 had a listing for him: "McCarn Henry (Myrtis G) artist Charlotte Engraving Co r Mount Holly". The date of his marriage to Myrtis is not known. His panel, Carolina Hall of History, appeared in 1938, and was recorded in the Catalog of Copyright Entries, Part 1, Group 2, Pamphlets, Etc., 1938 New Series, Volume 35, Number 11. In the 1957 Hill's Directory, Henry McCarn and wife are still at the same address, but his occupation is advertising at Belks (which was and is a major department store headquartered in Charlotte).